Even as they continue to work toward a negotiated solution to the crisis in eastern Democratic Republic of Congo (DRC), the leaders of the International Conference on the Great Lakes Region (ICGLR) are planning to deploy a 4,000-strong "neutral force" to the region to improve its security. Yet regional analysts and stakeholders are at odds over the force’s composition and mandate. Conflict in the region has escalated since April, when rebels known as M23 mutinied from DRC’s national army (FARDC). 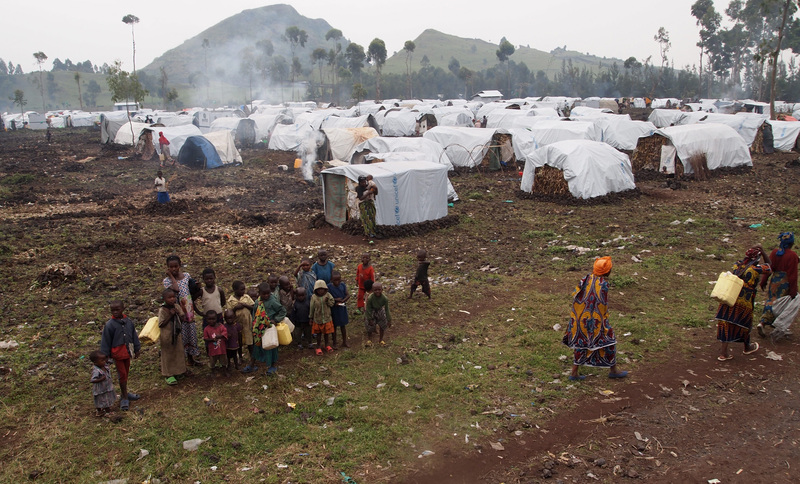 An estimated half a million people have since been displaced in North Kivu Province, according to the UN Office for the Coordination of Humanitarian Affairs. The ICGLR peace talks, which kicked off on 9 December, were scheduled to end on 18 December, but have been extended to 31 December due to the limited progress made. At the fifth extraordinary summit in Uganda's capital, Kampala, on 24 November, ICGLR leaders called on the DRC government to negotiate with M23. They also adopted the final concept of the operation and deployment of a Neutral International Force to combat "negative forces" in the region. "It's a dual process. We see the ongoing discussions as the best opportunity to end the current situation in eastern DRC. But basing on the past history, where peace agreements have been signed and not honoured, the member states are not taking any chances," Stephen Singo Mwachofi, ICGLR peace and security programme officer, told IRIN. Analysts are sceptical about the ability of the talks to bring lasting peace. "The Congolese government avoided those talks for six months and was forced to have them because of the fall of Goma [to M23 in November]. Given the circumstances and the fact that the Congolese government was cornered and had no alternative, these talks will not lead to a genuine peace agreement," Thierry Vircoulon, Central Africa project director for the think tank International Crisis Group (ICG), told IRIN via email. "Like in 2009 [when DRC reached a negotiated settlement with CNDP, M23’s predecessor], if the outcome of those talks is a new peace deal with an armed group, it will not be signed in good faith by both parties, and it will pose a serious problem of impunity and implementation." What will the force look like? According to Lt Col Paddy Ankunda, spokesperson of the Uganda-mediated peace talks, the neutral force will target M23, the Democratic Forces for the Liberation of Rwanda (FDLR), and Mai Mai militias, as well as the Ugandan armed groups the Allied Democratic Force (ADF) and Lord's Resistance Army. It will be based in Goma, the provincial capital of North Kivu. "All the stages, concepts of operation and agreements on the neutral force are done," he said. James Mugume, permanent secretary in Uganda's Ministry of Foreign Affairs, told IRIN that the African Union (AU) had approved the force, and the ICGLR was engaged in discussions with the UN Security Council for UN approval. Despite urgent calls for ICGLR member states and other African countries to contribute the required 4,000 troops, only Tanzania - under the ICGLR, which is to lead the mission - and Zimbabwe - under the Southern African Development Community - have offered to provide them. "The mission can succeed, depending on troops and logistics. We urge the member states and African countries to contribute troops. If the countries fail to raise the necessary numbers, the mission will fail," said Mwachofi. At the Kampala summit, DRC, Burundi, Rwanda and Uganda were excluded from contributing troops for the force. DRC and Uganda were accused by a UN Group of Experts report of supporting M23, charges both deny. "The decision on who should or should not deploy came out of consensus. Uganda, Rwanda and Burundi, for being neighbours and for having 'perceived interests', it was agreed they should not deploy," Ankunda, said. "The countries that were previously involved in what was called ‘the first African world war’ in the late 1990s - Chad, Zimbabwe, Angola, Burundi, Uganda, Rwanda and Namibia - should not be once again in DRC," said the ICG's Vircoulon. "This would bring bad [back?] the past back when two African camps were fighting each other in the DRC... Being party and judge of the conflict is a contradiction in itself." The force will require US$100 million, but has so far only received $20 million from the DRC government; South Africa has pledged logistical support. "We need material support in terms of equipment, helicopters, experts and support for follow-up mechanisms if the agreement is signed," said ICGLR’s Mwachofi. "We call [on the] international community to facilitate dialogue and support the neutral force. "The action taken and statements issued by the international community must weigh whether it complements the ICGLR process instead of inflaming on what is going on," he added. "Now that we have the dialogue, which is ongoing, they should issue statements that encourage and support the process." "Ideally, it ought to be funded by the AU and regional organizations. However, history shows that African governments are never prepared to put money into such things. It then boils down to the so-called international community putting up the money, as they have done in Somalia," Frederick Golooba-Mutebi, a political scientist and senior research fellow at the Makerere Institute of Social Research, told IRIN. "It would be good if they [the international community] put up the money and then pulled back and refrained from interfering and trying to direct, control or manipulate the process." Regional analysts warn that, unless care is put into the force’s timing, mandate and operations, it could backfire and worsen the crisis. "There are risks related to an offensive posture. The best way to mitigate those risks is to have very disciplined force, good coordination and have soldiers able to communicate with the population. The terms of the mission must be clear for everybody, the timing and the rules of engagement too," said Vircoulon. Angelo Izama, a political affairs analyst at the US-based Open Society Foundation, cautioned that the political process must not be abandoned. "A regional force must come out of a political agenda for the east of Congo, not simply out of a response to the security situation there. Unless political imperatives are relied upon to design an intelligent use of external force in the east, it will backfire. This has been the problem behind the episodic outbreaks of violence in that area, where force has been traded by local militias, regional armies and the international UN-mandated deployments," he said. "Military intervention is costly in blood and treasure, more volatile and therefore less sustainable, and attracts negative gains in relations with Congo and its neighbours and the international community," he added. "DRC's stability should remain an issue for its domestic political actors and that of its immediate neighbours. Other countries can act as interested observers and underwrite a negotiated settlement that arises out of the principled engagement of the most affected stakeholders." The entry of a neutral force will also have implications for the UN Stabilization Mission in the DRC (MONUSCO), which has been criticized for failing to prevent M23's capture of Goma and for perceived failures in protecting civilians. "This [neutral] force will have to demonstrate that it can do better than MONUSCO as a deterrent for the armed groups,” said ICG's Vircoulon. Ankunda said the neutral force would be keen to work with MONUSCO and FARDC on coordination, support and information-sharing. "We call for the change of MONUSCO’s mandate from peacekeeping to enforcement. We call for the amendment of chapter seven of the UN charter so that MONUSCO can support the neutral force to fight and eliminate the negative forces," ICGLR’s Mwachofi told IRIN. "It would be good to demarcate clearly what its [MONUSCO's] role and mandate are as opposed to those of the neutral force," said Makerere's Golooba-Mutebi. UN Under-Secretary-General for Peacekeeping Operations Hervé Ladsous told journalists on 7 December that the UN Security Council had "reacted with considerable interest" to proposed responses to the conflict - including the idea of a neutral force - and would review the ICGLR proposal in terms of how it can help advance the MONUSCO’s peacekeeping mandate. He added that the UN had responded to a request from Uganda for technical help with the ongoing peace talks in Kampala. The UN is embarking on a “strategic review” of its engagement in DRC, including MONUSCO’s configuration. Analyst Izama stressed that without political reform in DRC, peace would remain a pipe dream. "Legitimate local administrations which carry a local mandate are the best hope for peace," he said. "The first thing is to [draw up] a roadmap to local elections that clearly states its goal: the legitimization of local leaders with supervision from Kinshasa and with support from regional and international actors. The second is to guarantee a demilitarized process with severe sanctions for spoilers - this is where a regional force with international support can come in," he added.